Welcome to the Arkansas Medicaid beneficiary program. This is a program of the Arkansas Department of Human Services. It is run by AFMC. We help teach new Medicaid enrollees about their benefits and the services they can receive. We also help new enrollees choose their primary care physician (PCP). This is a statewide program. 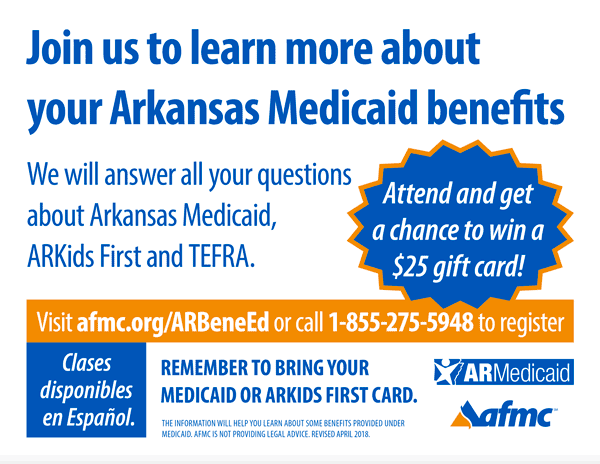 However, if you have questions about Medicaid, ARKids First, or TEFRA, there is help available in your area. To find this help, use the interactive map, or call 855-275-5948. We will help you register for local sessions in your area. AFMC hosted a TEFRA informational webinar on February 13, 2019. View the webinar here.